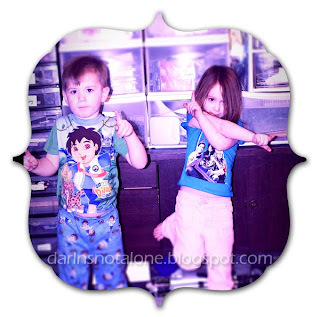 Leah's Crafty Life: These crazy critters of mine..
...aka the babies are having their birthday celebration today!! The fun thing about having them so close together, is they are the same age for a little over 2 weeks. In this photo, they are both FOUR!!! They both love to play with legos. They love to have made up stories at bedtime. Samantha loves ANYTHING with noodles in it. Cameron prefers TV Dinners lately... especially the ones with a brownie. Samantha thinks she is the boss. Cameron needs "help" when cleaning up his room. Daddy is the best thing since cheese pizza. Their big sister is their favorite playmate. And at this very moment, they are both overwhelmed with excitement for the shared birthday party! I can't wait until they see their birthday cake.. it's pretty cool. Happy Birthday party day you sweet ones!